Our new furnaces are more efficient and more powerful than your old heating system! Simply follow the link to fill out a simple form that will get you great deals offered by Superior. Have you considered geothermal HVAC? Many of our customers are going green and going efficient with geothermal home comfort solutions. Our team can install, maintain, and repair any brand of air conditioner! No job is too big or small. We look forward to keeping you comfortable! Did you know that modern thermostats can connect to your phone? Control Your Comfort from Anywhere! Keep your employees and your customers comfortable all year. Looking for a reliable solution to keep your inventory cool? We set the standards for excellence, working diligently to ensure your furnace continues to run smoothly and efficiently, day in and day out, year after year. Our heating experts are highly trained and capable of handling any furnace or boiler related problem, from minor to extensive, providing you with service you can rely on. Trust the trained professionals from Superior Comfort Inc. to be there when you need us, providing a full range of air conditioning service, repair and installation. As a dedicated HVAC company in the local community, we pride ourselves on superior customer service and competitive pricing, keeping our customers cool and satisfied during the hottest season of the year. Superior Comfort Inc. is your best investment in refrigeration. We provide superior repair and maintenance to keep your refrigerator or cold storage unit running at peak performance. Contact us and join our growing list of satisfied customers. 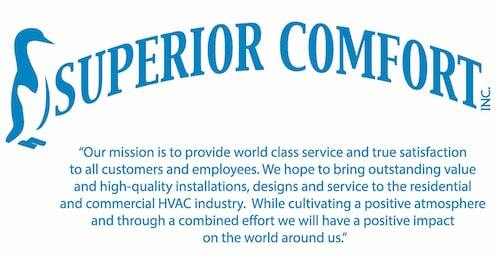 Superior Comfort Inc provides commercial HVAC service solutions, catering to businesses large and small across the region. Whether your problem is minor or major, you can rest assured we'll go beyond the level of service you expect. Reasonable rates, flexible appointments, extensive knowledge and a continuing dedication to customer satisfaction sets Superior Comfort Inc. apart from all competitors. We offer long-term solutions, keeping your family comfortable despite the weather outside. 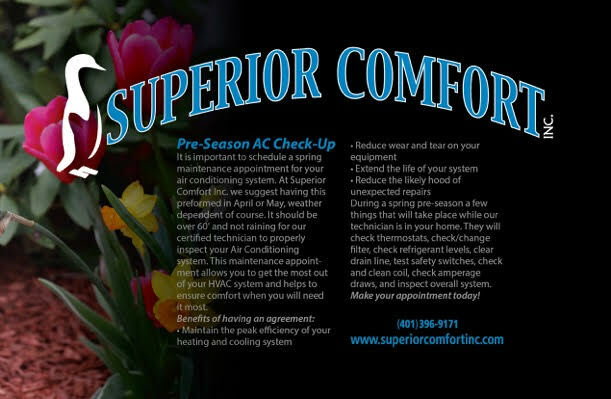 Superior Comfort Inc specializes in all things HVAC. From air conditioning and refrigeration, to furnace and boilers, covering both your home and business, our service technicians handle the task from start to finish. We’ll work closely with you, throughout each stage of the job, keeping you informed and ensuring your needs are met to your highest expectation. Whether you need service performed on existing HVAC equipment or looking to have a new system installed, we make sure you receive the fastest solution at the best possible prices. And our certified specialists are on call 24 hours a day, seven days a week, prepared to handle any heating and cooling emergency. Call Superior Comfort Inc. for comfort you can rely on. Unfortunately we have recently had several incidences to implement our new policy. Effective immediately Karla will now be calling our customers the business day before their appointment to confirm. If you are not home when our technician arrives you will then be charged our minimum service fee of $149. To ensure that your card is valid the day of your service we will be running the card just for an authorization for the minimum charge $149., we will NOT actually be capturing any funds until the service is complete and if you choose to use that card as the form of payment as opposed to cash or check.